Because of our dogs we have made some amazing friends over the years and Nick and Wanda who used to have a lovely pair of big Berners, Morgan and Oliver, Morgan was brother to our Reuben, needless to say as they are keen Berner fans they are lovely people and great friends of Rock HQ. Sadly they lost their lovely boys last year so as we have puppies who are grandchildren of Reuben and so related to Oliver they thought they would come and have a look. Smitten by the look of them. 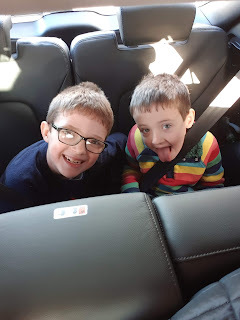 the boys loved the clean car and the kiddie seats at the back. seems to have stolen the hearts of Nick and Wanda so their just come and look trip turned into that ones ours trip. Hes going to have a lovely life spoilt rotten no doubt with lots of canal trips to look forward to. Talking of spoiled rotten this is Riley, living the life of, well herself.